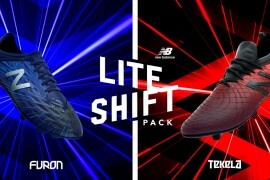 Football fans glancing back over the last 10 years will be only too familiar with the sight of bright football boots gracing pitches. 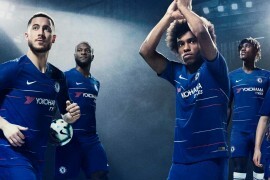 Just like any fashion, on-pitch wear changes with the decades, as well as the seasons: 10 years ago the football shirt was a baggy, loose fitting jersey. Nowadays the football shirt is a figure hugging, streamlined garment. Football boot appearance has changed considerably over the last 10 years too. Back in 2003, Arsenal became FA Cup winners, beating Southampton in the final. Of the 22 players starting the game, just six players wore coloured boots (all Arsenal players). Compare that to the 2013 FA Cup final, 20 players were in non-black football boots when Wigan beat Man City. 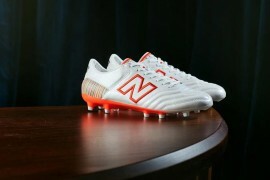 Love them or hate them, boot brands are not going to be easing up on novelty colourways any time soon either. 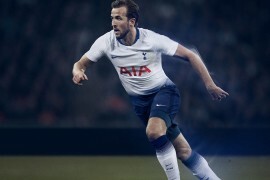 Nike, adidas, Puma et al are continuing in their quest to find a design that not only stands out for the TV camera, but also appeals to youngsters for them to trade good behaviour for the latest boot design. So how did the trend for dazzling footwear come about? donning a pair of white football boots in the Charity Shield for Everton as they beat Chelsea 2-1. The white football boots were branded Hummel, a relatively unknown football boot originally from Germany. 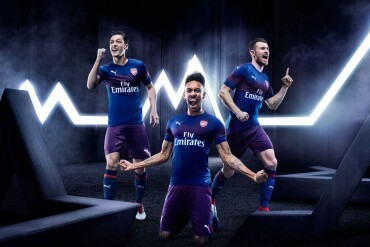 A UK franchise for Hummel had recently been set up in the UK and a forward thinking sports industry businessman named Brian Hewitt had been brought on-board to help drive the brand forward in the football industry. Brian, having previously worked in football with Slazenger, a big name in the 60′s/70′s, was tasked with taking Hummel football boots to the UK market. “I’d made around 5,000 sales of Hummel boots in the UK, but we just weren’t making it [big]. So I spoke to my guys and said nobody’s done it yet, let’s paint the boots white”. ‘So paint their boots white’ was exactly what Hummel did. They then approached Alan Ball, a huge star at the time (World Cup Winner with England), requesting that he put his name on the white boots. Alan felt he had nothing to lose so he was on-board. Having a white boot didn’t make a massive dent in the football boot market, so Brian arranged for Alan Ball to wear them in the forthcoming Charity Shield match. The problem was, Hummel didn’t have any boots that were right for Alan to use. Wolstenholme mentioned Ball’s white boots several times in commentary and the TV camera featured close up shots of Ball and his shiny white boots on more than one occasion. The Monday after the game and the Hummel sales line was ringing off the hook. 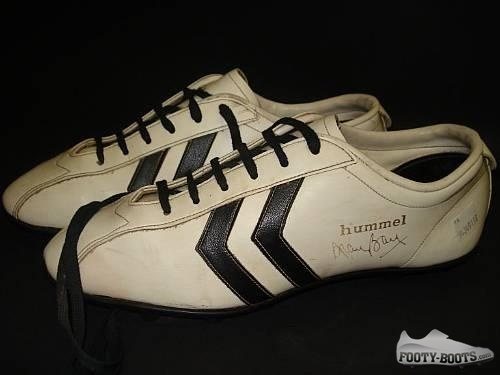 12,000 pairs of white boots were sold, more than doubling Hummel’s entire sales quota’s in one morning. Hummel soon improved the quality of their boots and supplied genuine Hummel white football boots to Alan Ball, which he took to the field in. Several other players began wearing Hummel coloured football boots, such as Charlie George of Arsenal who christened red football boots. Due to the success of the white football boot, other brands gradually began introducing coloured football boots; the 70′s and 80′s saw flashes of fashionable neon colour brought into the details of boots, across the soleplate and in the branding. By the 90′s, brands like Lotto and Diadora made their mark with luminous green detailing on black uppers and today, it’s harder to buy a black football boot than it is a coloured one. Previous articleDiadora Cambio | A Gimmick Too Far? Isn’t hummel a Danish brand? I had a pair of these, they rubbed the skin off on my achilles whenever i wore them. i was desperate to have them but when i got them they were a big disappointment, but at least i had the same boots as Alan Ball. I was looking at some old Goal football magazines for season 1968/69 and Wyn Davis of Newcastle United can clearly be seen waring white football boots for that season. So Wyn Davis pre-date the late Alan Ball by 2 years.